. : Optics & Photonics Focus :: Shades of 3D Vision :. Does a photon gain or does it lose momentum when it enters a glass slab? Both may be the simple, yet ingenious answer to this centenary dilemma. How does the brain recreate a 3D world from the 2D images the eyes capture? 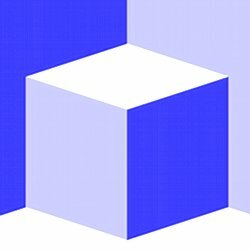 Recent evidence shows that shadows and light may be even more important than was originally thought when it comes to the recreation of a 3D world in the brain. Illusion of depth in a flat image. Is the cube engraved or embossed on the screen? The brain uses the shading patterns to recreate the third dimension and therefore the illusion of depth. Whether you perceive the cube as being engraved or embossed depends on where your brain is assuming the light is coming from. In fact, with a little effort you can even train your brain to “see” either image on command. Without 3D vision, tasks as simple as catching a ball, threading a needle, or even reaching out to shake a friend’s hand, would prove very difficult, and this would have important consequences on everyday life — starting from your friends thinking you have no manners. The brain actually recreates a 3D world from the 2D images the eyes capture. As Pascal Mamassian, from Paris Descartes University, France, and Peggy Gerardin and Zoe Kourtzi from Birmingham University, United Kingdom, have recently shown, the brain creates the third dimension by first interpreting the shading patterns and then, as a second step, by decoding the overall meaning of the scene. The eyes’ retina only captures 2D images of the world — yet we clearly perceive a 3D world. Where does this extra dimension come from? The answer lies in the way the brain’s visual system combines the slightly different images from the right and left eye: the larger the apparent displacement of an object, the nearer it is assumed to be. You can easily experience this effect by placing your thumb a few inches in front of your nose. If you look at your thumb first with your left eye and then the right one, you will see that it appears to move; as you increase the distance between your thumb and your nose, your thumb will appear to move less. Let us now consider a slightly more challenging situation: imagine you are looking at a photograph of a little house on a prairie. To add to the challenge, go ahead and shut one eye. You will notice that, even with one eye closed, you can still obtain vivid impressions of depth. This kind of 3D perception cannot rely on the stereoscopic comparison of the images captured by both eyes, but must make use of other cues such as the shading patterns in the picture. These shades can make an object appear concave or convex; however, they strongly rely on the knowledge of where the light source is. The brain’s visual system needs to guess the position of the light source in order to infer the depth of a shaded picture. Since for millions of years our leading light source has been the sun, which usually happens to be above our heads, it comes as no surprise that our visual system would seem to assume that all light must come from above; this, in fact, is something that psychologists have known for over a century . Mamassian and coworkers Gerardin and Kourtzi, performed a study to understand the interplay between illumination and 3D shape perception. The question was about the exact process followed by the brain in reconstructing the vivid impression of a 3D reality in our minds. Is the overall meaning interpreted in the first place, with the details, such as the illumination, taken into account only subsequently (top-down processing)? Or is it the other way around, with the illumination accounted for before the overall meaning of the scene is interpreted (bottom-up processing)? Until now, the processing of 3D shapes was thought to occur in the brain’s visual system in a top-down manner. However, the evidence produced by Pascal Mamassian and coworkers shows that it may well be the other way around. It seems that the areas of the brain that process simple features of an image are activated when subjects process information about light, and that this level of processing then influences the 3D shape building in those brain areas that process more complex feature of the images, such as whether the image is convex or concave. According to Mamassian, "what is rather surprising is the finding that illumination is taken into account so early in visual processing. Up to now, the common assumption was that prior knowledge had to be used in a top-down fashion as if I were reasoning that light must be on the left of the image because I can see shadows on the right of the corresponding objects." Wilson Geisler from the University of Texas agrees that "the study by Mamassian and coworkers provides solid evidence that [the standard] view is too simple." The surprising finding that 3D images are processed with a bottom-up approach came from looking at the subjects’ brain activity. Mamassian and coworkers designed a simple experiment in which subjects were presented with images lit from one of four possible light directions. 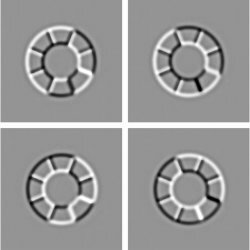 These images were ambiguous: the same image could be interpreted as a convex ring or a concave one depending on where the subjects assumed light was coming from. When looking at these images, the subjects had to decide whether they had a concave or convex shape. During the experiment, the subjects’ brain activity was recorded through a neuroimaging technique called functional magnetic resonance (fMRI). When a brain area is more active it consumes more oxygen, and to meet this increased demand the blood flow to the active area increases. fMRI detects which parts of the brain show these signs of neural activity. The study by Mamassian and coworkers brings a new possible insight into the way the brain constructs 3D reality. In perceiving 3D shapes from shading patterns, the brain goes from a simple processing level, by understanding where light is coming from, to a more complex level in which the previous information of light is used to decide the 3D shape of an image. This finding contradicts the current visual theories of the brain and shows that perhaps its visual system works in a bottom-up fashion. "In retrospect," Geisler concludes, Mamassian’s finding that lightning is taken into account "in early visual areas is plausible. I think that the result obtained by Mamassian will motivate new models of shape from shading and perhaps new studies of neural activity in the primary visual cortex of primates." J. Sun & P. Perona, Where is the sun? Nat. Neurosci. 1, 183-184 (1998). P. Mamassian & R. Goutcher, Prior knowledge on the illumination position. Cognition 81, 81-89 (2001). JBP is currently working on her Doctoral Thesis in Neuroimaging at the University of Barcelona, Spain. Peggy Gerardin, Zoe Kourtzi & Pascal Mamassian, Prior knowledge of illumination for 3D perception in the human brain, PNAS (2010) 107, 16309–16314 (link).